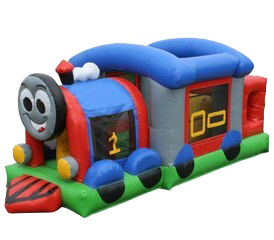 All Aboard this Happy Train Small Combo Design Bouncer. Perfect for toddlers or smaller kids. Can also be used indoors as its only 9ft high. Jump, climbing wall, slide and obstacles. Enter through the back of the train to climb and slide, or enter through the front to go straight to bouncing area. j It features an inflatable safety ramp at the entrance to protect excited kids as they scramble to get inside the bouncer. It also has large netted vent windows that keep things cool for the kids and allows parents to keep a watchful eye on all activities inside. Appox 6-8 users at a time.